I was in Oahu on vacation with the family, five days into a 20-day stay on the island. For the fifth day I made a trek to the Ko'olau Summit, using yet another trail on one of the many ridges found on the leeward side of the range. One might get the impression that I must simply love wallowing in mud, getting wet and climbing to summits with no views, but there was method to this madness - I wanted to collect as many of the Ko'oalau summits as I could before my daughter arrived. She was the only one who expressed any actual excitement about hiking with me (though my wife has been a good sport on a few occasions already) and I wanted to get the tougher ones out of the way so we could enjoy more touristy hikes combined with touristy drives around Oahu. She was supposed to arrive the previous day, but American Airlines has suffered weather and other problems in the past few days and passed those on to their customers. So with another day sans daughter, I headed to another Honolulu neighborhood to hike the Wiliwilinui Ridge Trail, less than 2.5mi in length with 2,000ft of gain. A fairly easy hike by Ko'olau standards as I found this trail better than the others I'd been on already. Getting to it was pretty easy as there are road signs directing one to the TH as one drives up Laukahi St from SR72. The upper portion of the road goes through a newish, high-end neighborhood and one must first pass muster with the guard on duty at the checkpoint. Luckily it's not that exclusive and I simply had to show ID and tell him I planned to hike. He handed me a placard to put in my window and sent me on my way. The trailhead is found at the highest point on Okoa St and unlike some of the other ridge THs, they have parking right there, no need to inconvenience the neighbors by parking in front of their homes. The trail itself is one of the better ones in terms of trail maintenance. That's not to say it wasn't a complete mudfest - it was, but the trail is generally wide and not overgrown, even in the upper sections. The mud begins after the first half mile of trail and continues on and off for the remainder of the hike. I danced around it only as a way to keep my boots semi-dry as long as possible, knowing they would once again become saturated before I got back. 45min into the hike and about half an hour from the Ko'olau Summit, the cruising part of the trail ends and the stairs begin. There's even a bike rack to park your bike, not that anyone would have been able to ride through the mud today to reach it. The stairs were installed by volunteers with the Hawaii Chapter of the Sierra Club. A sign here asks you to wipe your boots on the brush pad installed at the foot of the stairs. Nice idea to help keep out invasive seeds, but if you don't change out the brushes periodically they become clogged with mud and debris and do little good. I wiped my muddy boots on the muddy brushes anyway. The stairs begin gaining altitude quickly and you can feel it in your thighs soon enough. No complaint though, as they are WAY easier than a slippery slope with a sketchy rope to depend on. In fact, there were several such handlines installed even with the steps, not really necessary, but nice to know they're there in a pinch. Part way up the stairs I came across a local couple resting on their way up. This was their first trip up the trail too. We talked briefly and they wondered how much longer the trail was. I checked the GPSr and told them half a mile which seemed to hearten them (in fact it would be a little less than that since I was heading to Peak 2,620ft, past the end of the trail). Continuing up, I passed by a rusting telecom installation which I had though might be the top but that was a minute further on where there is a small view bench, wet and without views today. A pair of signs implore one to go no further due to dangerous cliffs. Peak 2,620ft, invisible through the clouds, lay only an eighth of a mile to the south. Past the signs I went. It was very wet and overgrown here, and what parts of my boots, socks and feet that had so far managed to evade the dampness were soon awash with wet and mud in my now squishy boots. My pants got a soaking pushing through the brush and my gloves, too, became a sopping mess. 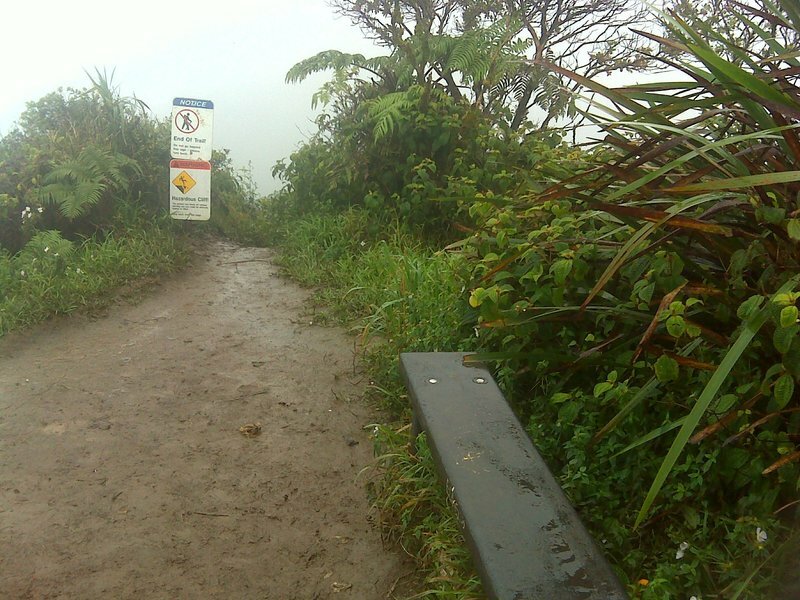 The traverse over to the peak along the Ko'olau Summit Trail was not as bad as the previous day, and though there was slick, muddy backsliding, it did not have the same excessive exposure. Maybe that was because I couldn't actually see the exposure like the previous day when weather conditions weren't quite so bad. Anyway, I had only a short distance to go to experience standing atop Peak 2,620ft without finding much to recommend it.